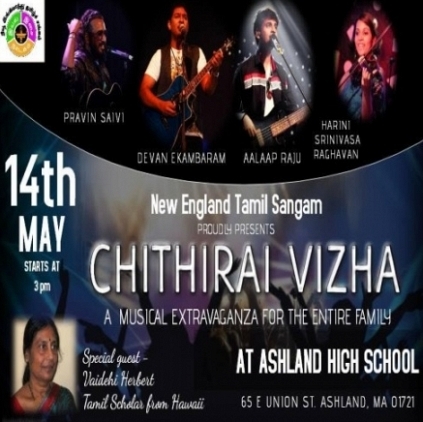 On May 14th, a first of its kind event is said to happen in the history of New England Tamil Sangam. A celebrity musical extravaganza with live orchestra on NETS Chithirai Vizhaa 2016 at Ashland High School is scheduled. Music Composer/Singer/Vijay T.V Judge Devan Ekambaram, singer Aalaap Raju and Vijay T.V Fame Pravin Saivi and Berklee Fame Harini Srinivasa Raghavan with the NJ Musicians Jomy and Jeremy will be rocking the show. Local Talents will also be involved in Super Singer Competition, A Capella and Sing with Devan Team. In addition to the musical night, a great Tamil Scholar from Hawaii, Mrs.Vaidehi Herbert known for translating all Tamil Sangam Literature will be there to give a great speech on our Chithirai Vizhaa. Please be there to see the program LIVE!!!. 65 E Union Street, Ashland, MA. People looking for online information on Chithirai Vizha will find this news story useful.